The "Christian Flag" is a white flag with a blue canton and a red cross in it. It was designed by Charles Overton in 1897 to represent Protestants of all denominations. (See the Knopf "Eyewitness Books" volume entitled "Flag".) Of course all the Scandinavian cross flags could be called Christian, considering the story of King Valdemar in 1219 in Denmark, who saw the cross of Christ, and it led him to victory. Having lived in Sydney for over seven years, I have never seen the Christian Flag displayed (let alone flown) in Australia. - Such mainstream Protestant groups as the Methodists and Presbyterians gave explicit sanction to the use of the "Christian" Flag in churches in resolutions passed in the 1940s. - A great many local church websites of mainstream Protestant churches (Presbyterian, Methodist, and, of course, Baptist) mention either the display of the "Christian" Flag or the pledge to it. This suggests that its use is rather widespread, beyond just the conservative evangelical bodies. - Several sites mention that Lutheran churches began using the Christian Flag along with the US flag in churches during the World War II years. They attribute this practice to German-Americans wanting to prove their patriotism. - The United Methodist and Evangelical Lutheran churches' websites contain articles expressing disapproval of the display of either the US or "Christian" Flags in churches. On the other hand, neither was prepared to say that their use is impermissible. To put things in perspective, the sizes of the denominations we're talking about here are about 30 million Baptists (of which about 16 million are Southern Baptists); 13 million Methodists (of which about 8 million United Methodists); 8 million Lutherans (roughly 5 million Evangelical Lutheran Church in America and 3 million conservative Lutheran Church-Missouri Synod); 4 million Presbyterians; 2 million Episcopalians. These compare to some 60 million Roman Catholics (virtually all of whom have the Stars and Stripes and Holy See flags in their churches). A conference of "mainstream" Protestant denominations some decades ago concluded that the Christian Flag, if displayed, should take precedence in a church over the national flag. Actual practice varies between individual parishes/congregations. The Catholic church my wife and children belong to has the US and Holy See flags in the seating area of the church, with the Holy See flag on the right (US flag code says under that arrangement, the US flag should be on the right). The Presbyterian church to which I belong has the US and Christian flags right at the base of the raised area on which the minister conducts the service. Again, the Christian Flag is on the right, the reverse of the US flag code arrangement. But the nearby colonial-era Episcopal church has the US and Episcopal flags hanging on the wall above the pulpit, with the US flag to its own right, as the Flag Code calls for. This flag should really be designated as "Christian Flag", i.e. with *heavy* quotation marks. It is no more *The* Christian Flag than any of the Earth flags is *The* flag for this planet. I don't think that this is a question of denominations, but rather a question of nationality. It is pretty well known in the USA, but beside some vexillologists no one outside USA knows it, I guess. And even more, as we have discussed a little bit the topic "flags in churches", there is obviously no need felt by Christians in other countries to have a common Christian flag. There are just too many different traditions of flying flags *in* the church or *from* the church building or *on* church grounds! It's correct that this flag isn't known by Christians world-wide. Because it's a free flag and doesn't stand for a political entity or a certain church, its acceptance can't be decreed. This flag is as successful as it is known and accepted by Christians. The designation 'Christian Flag' does not apply to its acceptance but to its *message*. This flag is over-denominational and wants to symbolize the Christian faith, the faithfulness for Christ and represent all Christian believers. This was also the intention of its creator. Therefore it was called 'Christian Flag' from the beginning, and, as I can see, this designation has been accepted wherever this flag was shown. Moreover I haven't met another flag with that name (there are many denominational Church flags but not with the claim to represent all Christians). So I think it's not exaggerated to write 'Christian Flag' with a big F (in German with a big C). Indeed this flag is being used more by Protestants than by Catholics but this has foremost historical reasons (it was created in a Protestant church and thus spread more in the Protestant sphere) and I suppose that the concurrence of the Vatican flag plays its role. As long as there is no other flag with the same meaning and claim, I don't see a problem calling it "the Christian Flag". As I said, its name refers to its message, not to its universal acceptance (which nobody alleges). Just because there are many other particular flag traditions, there is a need for a common flag without institutional bonds. The Christian Flag is reported in use (as well as in the USA) in Canada and I have seen photos from Brazil and even a photo from the South Sudanese SPLA soldiers carrying it. I know from two German Free-Churches using it and a German flag trader offering it on his website, and from some Swiss Christians. There is one of those flags at my church (on the stage, along with the Canadian flag, the Canadian flag is on the viewer's left! ), the blue is a lot lighter, though. A few important notes on this fact: first of all, my church (and the denomination to which it belongs) is Canadian! I would also assume that the flag was purchased here in Winnipeg, so it must have some knowledge in Canada. My church denomination is also Protestant, we are a member of the Evangelical Free Church of Canada (I will say that I don't know if it's in other EFC churches in the country, I've only been in mine, and I haven't seen it in other Protestant churches that I've been in). The flag is also used by some foreign Protestant groups connected to US evangelical missionary organizations, particularly in Latin America. Pictures on the Frontline Fellowship website showing the Christian Flag are mostly taken in Sudan and Zambia. Hundreds of Christian Flags are flying in each of those countries. They have all been taken in the last few years. These flags most certainly do play a part in the Christian communities. They serve as a witness, as an identification symbol, as an inspiration, and as a reminder that we are also citizens of the Kingdom of heaven. The featured speaker failed to arrive for the Sunday School Rally in a Coney Island Chapel in 1897, and - the Christian Flag was born. Like so many of the great and memorable things of history, a Christian Flag was not contemplated or predesigned. A fortuitous happenstance gave it birth. The Sunday School was holding an old-fashioned Rally Day of the kind which was so much the custom in years past. For this occasion, a favored speaker had been engaged, but for some reason undisclosed did not show up. Superintendent Charles C. Overton, in the emergency, called upon his own gifts of innovation to fill in the time. An American flag lay there across the pulpit. Overton addressed his words to the flag and its symbolism. Then like a flash came the thought, why not also a Christian flag? His impromptu but constructive ad-libbing was to produce a verbal picture of what is today, and for the past one hundred years has been, the Christian Flag. Today the Christian Flag is one of the oldest unchanged flags in the world. It was conceived at Brighton Chapel, Coney Island, New York, Sunday, September 26, 1897, and was presented in its present form the following Sunday by its originator. Call it chance, or providence, serendipity, or the plan of God. On that day, the Christian Flag was born. All church flags are organizational symbols of specific corporate, legal, religious entities. The Roman Catholics, Episcopalians, United Methodists, Baptists, United Church of Christ, and others have flags, official or otherwise, but limited to their use and ruled by them. Not so with the Christian Flag. This flag stands in its own right, shines by its own spiritual light, true, free, untrammeled, uncompromised. It belongs only to Christ and the Cross which symbol it bears. Why is the cross so emphatically magnified in the new Affirmation of Loyalty? The Cross in size is the smallest component of the total flag. And yet the whole message, theological and ecclesiastical, lies in that small but eternal symbol. Without this Cross, this flag would be little more than a decorative piece of cloth. The force of this fact is climactic. If there were no Cross, there would be no post-resurrection Christ, there would be no church. All hinges upon that Cross. This syllogism lifts up and boldly states the historical and eternal fact: the Cross is at the heart of it all. Many are the theories of the atonement of God and persons through the sacrifice of Christ upon the Cross, and many are the theological nuances meticulously spun out by the Christologists. There is one thing, however, upon which all of the interpretations of the atonement agree, namely, the indispensable centrality of the Cross. Because of that Cross, Jesus is not just another miracle worker recorded in the passing pages of Roman history. He is Christ, the Son of God, sacrificial and triumphant, the Savior of the world, the world God so loved. So understood, the Cross of Christ on the Christian Flag is the summation of it all. And to be adequate to its high purpose, the new Affirmation of Loyalty to the Christian Flag expressly includes that Cross. The Affirmation of Loyalty to the Christian Flag is a sacred commitment. Let the congregation celebrate its loyalty to the Christian flag and the Cross which it bears by extending to it appropriate recognition and honor. 1. Let us stand facing the Christian Flag. 2. Let us repeat the Affirmation of Loyalty in unison. "I affirm my loyalty to the Christian Flag and to our savior whose cross it bears, one spiritual fellowship under that cross, uniting us in service and love." 3. Let each person conclude the Affirmation with a slight but positive nod to the Flag. The congregation may now sing one or more verses from a hymn of its choice, such as Stand Up, Stand Up for Jesus, or other appropriate selection. 4. Let us now participate in our Christian Fellowship by holding hands in an inclusive chain from person to person and pew to pew during the concluding prayer. The minister or lay person presiding will offer here a brief appropriate prayer, marking the conclusion of this celebration of the Affirmation of Loyalty to the Christian Flag. Located by Ned Smith, 17 June 1999.
with mercy and grace for all. 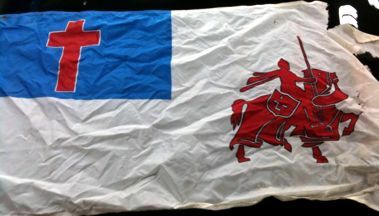 This variant of the Christian flag bears a red knight in the fly. We do not know if this flag has any special meaning or is a local variant. It was spotted in southern Ontario. It's only a guess, but the flag might have been made up as a flag for a local Christian school, probably somewhere in the US. I would also guess that the emblem in the fly would be that of a "Crusader" which used to be a popular mascot name among Christian schools. For obvious reasons, the "Crusader" nickname has fallen out of vogue. I found the white fimbriation around the cross interesting as it doesn't exist on any Christian flag that I have ever seen. And, the blue is too "royal blue" compared to most Christian flags which are generally made with a darker US flag blue or UK flag blue. The flag does appear to be printed, meaning that a bunch of them would have been made.